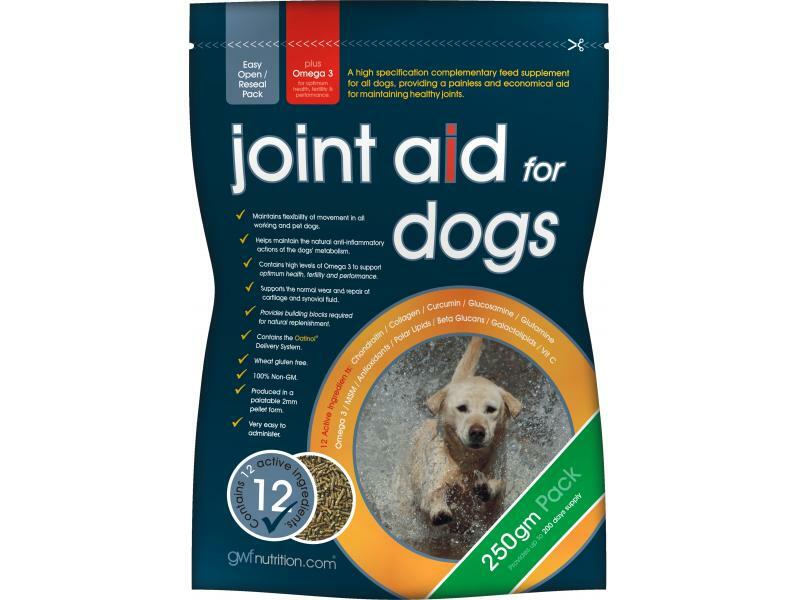 Joint Aid is a high specification complementary joint supplement for all dogs. Manufactured as very palatable 2mm pellets for quick and easy feeding; it provides a combination of 13 active nutraceuticals to maintain healthy joints and aid freedom of movement regardless of age, size and level of exercise. When should I add Joint Aid to my dog's diet? âJoint Aid can be fed to all dogs alongside their usual diet from any age at the 'General Support' level to maintain freedom of movement throughout their lives. For elderly and working dogs showing signs of restricted movement, Joint Aid is recommended to be fed at the 'Full Support' level. What are the key benefits of using Joint Aid for Dogs? Contains 13 active nutraceuticals, including high levels of Omega 3 to support optimum health and performance. Contains the unique Oatinol Delivery System to maintain a healthy digestive tract and a high rate of absorption of essential nutricines, vitamins and trace elements from the diet. Manufactured as very palatable and easily digested 2mm pellets; perfect for mixing with the dog's normal feed. Chondroitin Chondroitin is essential for the resilience of cartilage by maintaining the resistance to compression. It also aids the repair and formation of connective tissue. Collagen Collagen possesses great tensile strength and provides the body’s tissues with their firmness and strength. Referred to as the “glue that holds the body together”, it is essential for connecting and supporting the bones, tendons, muscles and cartilage. Curcumin Curcumin is the active ingredient of the spice, turmeric. It is a natural and powerful antioxidant and supports the normal anti-inflammatory action of the body. Glucosamine Glucosamine gives cartilage its strength, structure and shock absorbing qualities. It is involved in the formation of tendons, skin, bone and ligaments and is found in high concentrations in connective tissue and cartilage. Glutamine (Glucose Fermentation) Glutamine is a protein derived amino acid that supports the natural immune response and is essential for gut wall integrity. Hemp Oil DerivedOmega 3 Fatty Acids Hemp oil is probably the best source of Omega 3 Fatty Acids found in the plant world. This unique combination enables the dog to produce other essential Omega 3 fats called EPA & DHA, both of which are normally only found in fish oils, but are crucial for the health, fertility, condition and performance of the animal. MSM (Methylsulfonylmethane) MSM is a source of natural organic sulphur. Sulphur is found in high concentrations in joints and helps to form cross links with other molecules that maintain the strength and integrity of connective tissues. Vitamin C Vitamin C is essential for the production of collagen in the body that forms the matrix of connective tissues in mammals. It directly affects the level of tissue growth, development or repair after injury so is crucial for healing and the body’s immune system. 2. Joint Aid for Dogs can be fed to all dogs, regardless of age or level of exercise. Below are some recent questions we've received regarding GWF Nutrition Joint Aid For Dogs, including answers from our team. Hi, please could you let me know if it is safe to use this alongside the Yumove joint supplement chewable tablets for my dog? My dog is 8years old, weighs 47kg and suffers with arthritis in back legs. We wouldn't advise that you use two joint supplements together, especially as they contain similar ingredients. Although both products have proved very effective in many dogs it is what your dog responds to best. I would suggest using one or the other not both. If you require a stronger strength for a more severe condition, your vet can suggest Yumove Advance that is only exclusive to vets or directly from the manufacturers. Does Jointaid contain Glucosamine HCL or Glucosamine S04. Its not clear from the packaging or the website. Thank you for your question, the product contains Glucosamine HCL. The answer is that you would have to try it to find out. Generally none of these products upset the digestion, but some dogs as you say are easily upset. You should allow a gap between them both, then make sure that you are very consistent with the normal diet, then see what happens if you try it. All should be well, but it is impossible to guarantee. They are different products with reasonably different ingredients, so there is no real reason to think that this one will cause problems. I have flexidog chews with a glucosomin content of 600mg per chew. What is the equivalent amount of glucisomin in one measure of joint aid? The man at GWF has told me that "Glucosamine is included at 2%, so on a 10gm (one measure) inclusion, it will provide 200mgs." What is the shelf life of this. If I bought a large tub which will last over 6 months, will it go out of date? Generally our stock of this product has much more than 6 month's expiry date. If you order some, you can always stipulate when ordering that you need a minimum of 6 months before the expiry date. If you order online, click on the line "Add Notes for VioVet Staff" to do this on the checkout page. Hello my dog Tia is 7 yrs and 11 mths old, she is a boxer cross and is 4 kg's overweight and has just been diagnosed with the early stages of arthritis, she has just taken her second tablet of Rimadyl which i don't like giving her. Would you tell me the amounts of each ingredient of the Joint Aid please. The amounts of Oats, Hemp, Seed Meal Sugar Beet Pulp etc are not stated. We have now put a list of ingredients on the product listing.